Pictured: Table of donated school supplies. Pictured: Fran Wallace, Schools Financial Credit Union, Placerville Branch Manager; Teacher Sandee Bangs; and Holly Brown, Schools Financial Credit Union. 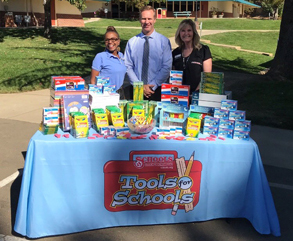 Teachers at Louisiana Schnell School and the El Dorado County Office of Education’s (EDCOE) Placerville Head Start classroom excitedly received school supplies as a result of recently winning the Schools Financial Credit Union ‘Tools for Schools’ award. 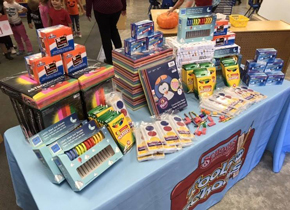 The supplies included colored construction paper, dry erase markers, colored markers, glue sticks, ruled-paper notebooks, pencils, erasers, safety scissors, and file folders. Sandee Bangs, veteran educator with 27 years of experience and EDCOE Head Start teacher, expressed, “These classroom materials will enable students to successfully learn essential classroom and social skills. In Head Start, we focus on helping students develop the fine motor skills needed to learn to write, learning numbers, recognizing number groups, colors, shapes, and introducing them to the alphabet." “We are fortunate to have dedicated and passionate educators like Sandee, and sincerely appreciate the support from Schools Financial Credit Union,” Superintendent of Schools, Dr. Ed Manansala noted. 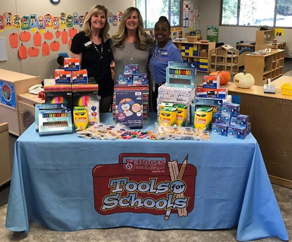 The ‘Tools for Schools’ program was born of the great need expressed by classroom teachers for school supplies. The program provides classroom materials to thousands of students in the communities that Schools Financial Credit Union serves. This year, over 1,500 nominations for 563 schools were received describing how teachers and students would use and benefit from a large amount of classroom supplies. “We were really moved by the level of need expressed in the 1,500 nominations we received for our ‘Tools for Schools’ program this year and especially by those submitted on behalf of Louisiana Schnell Elementary and Placerville Portable Head Start,” expressed Cathy Grimes, VP of Marketing, Schools Financial Credit Union. “This was a surprise, and it will be a great benefit to our Head Start and State Preschool families. Thank you Schools Financial for this gift!” expressed Jenny Pettit, Director of EDCOE Child Development Programs. The Head Start/State Preschool program is a publically-funded parent participation program for income eligible families with children from 3 to 5 years of age offering an individualized preschool experience in a center-based setting. The program promotes family engagement and provides a high-quality preschool experience to prepare children for success in school and life. For more information about the Head Start program visit EDCOE. Louisiana Schnell School provides children with an excellent educational program that prepares them academically and inspires them to be confident, life-long learners who strive to realize their potential and make a positive contribution to society. For more information, visit PUSD. For more information about the ‘Tools for Schools’ program.